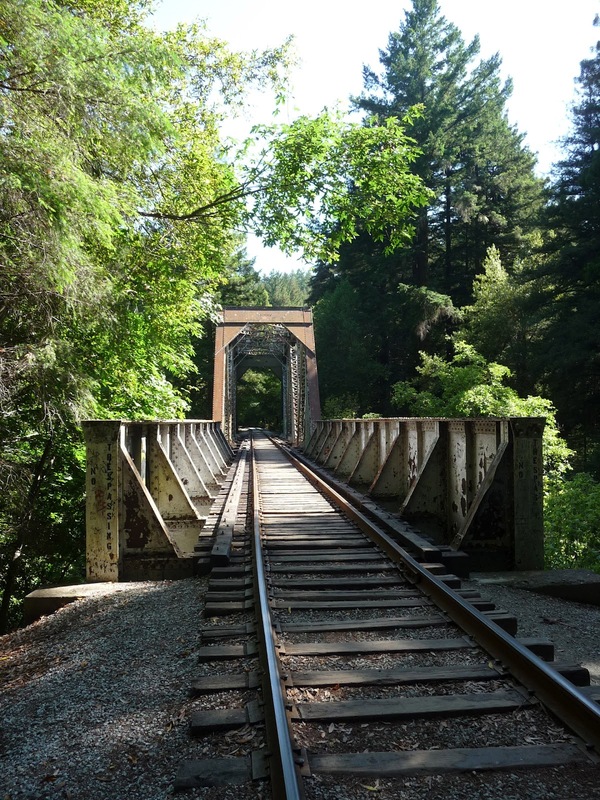 Felton was home to several railroad bridges of various styles and qualities, running from the massive trestle-truss complex over the San Lorenzo River south of Big Trees to tiny unrecorded bridges over Toll House Gulch and other small seasonal streams. The Santa Cruz & Felton Railroad was initially responsible for overcoming most of these barriers, but both bridges over the San Lorenzo River in the Felton area came at a later date. 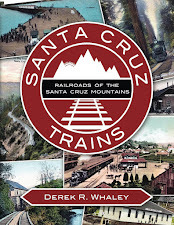 In early 1875, the Santa Cruz & Felton Railroad began grading south from Felton. It was a low-budget operation with few long-term plans and, as such, the company built relatively cheaply. 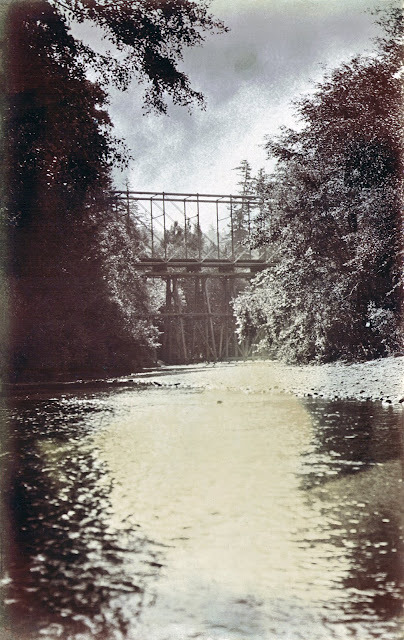 All of its bridges were entirely constructed using old-growth redwood harvested from along the right-of-way and from local mills such as George Treat's near Toll House Gulch. Other than their existence, nothing is known about these early bridges except that they were all relatively short and probably followed a trestlework design. At a minimum, relatively substantial bridges were built over Shingle Mill Creek and Gold Gulch, with smaller structures required over Toll House Gulch and possibly other seasonal streams in this section. 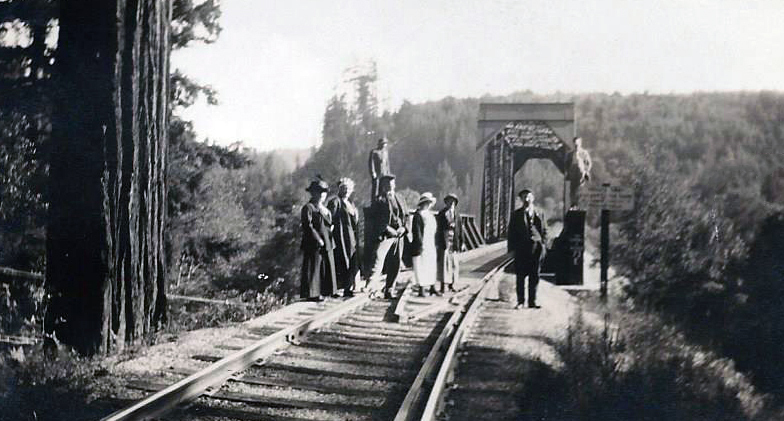 A total of eleven bridges were required along the entire route between Felton and the Santa Cruz Railroad Wharf, and not all of them have been accounted for and only three have extant photographs. Over the subsequent four years, the railroad reinforced and strengthened all of these bridges, as necessary, and it seems likely that the South Pacific Coast Railroad, which took over the line in 1879, retained the original structures when possible. There is little evidence in newspapers and other records of these bridges being replaced or upgraded during the decades of their existence. 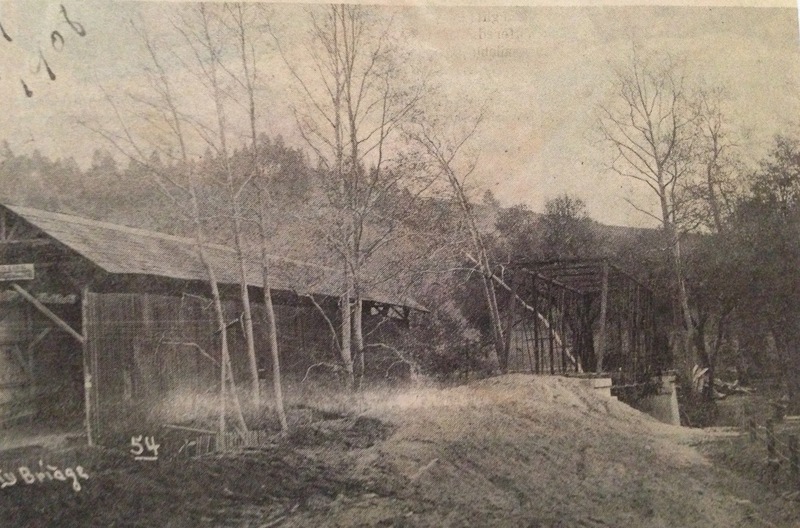 All such structures were removed around 1908, when the Old Felton Branch (as it was called by the Southern Pacific Railroad) was dismantled and a new bridge over the San Lorenzo River replaced it. Throughout late 1879, the South Pacific Coast Railroad erected a substantial bridge over the San Lorenzo River just to the south of Big Trees. This bridge acted to connect the new route to San Jose and Alameda Point to the old Santa Cruz & Felton Railroad line, which it joined at a new location called Felton Junction. The bridge crossed the river at an especially wide point over an old floodplain. Significant trestlework was required on the south side to bring the right-of-way to the grade of the existing railroad line. The Southern Pacific Railroad, which leased the line in 1887, filled in this trestlework and it remains an obvious fill today. Over the actual river, the South Pacific Coast installed an open-deck Warren truss bridge. 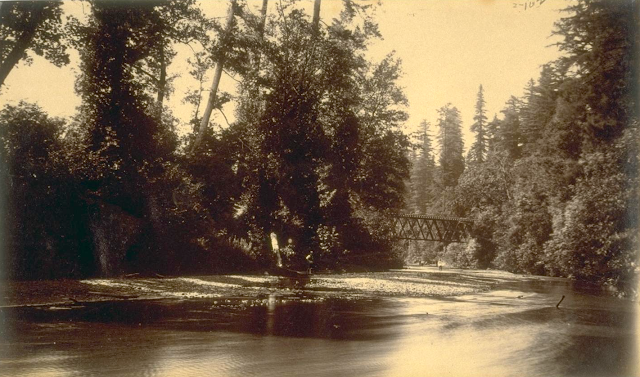 The second bridge at Big Trees after it was standard-gauged, 1908. This truss was replaced in 1905 with a rather unique-looking thru double-intersecting Pratt truss bridge that gave much greater clearance under the bridge for the river and debris to pass under. The structure, built by Clarke, Reeves & Company and Phoenix Bridge Company, included two new wrought iron features: Whipple-Murphy truss supports and Phoenix columns, both of which were intended to provide additional support to the structure. This may have been a solution to winter storms, which habitually caused the water levels to rise and likely damaged the truss periodically. Photographic evidence reveals that this truss was expanded to support standard-gauge service around 1908, but the photograph above suggests that the bridge could not sustain the increased weight of the heavier trains, requiring extensive supports in the river to support the span. With destructive river storms a constant threat, cluttering the river with multiple bents and piles was impractical. 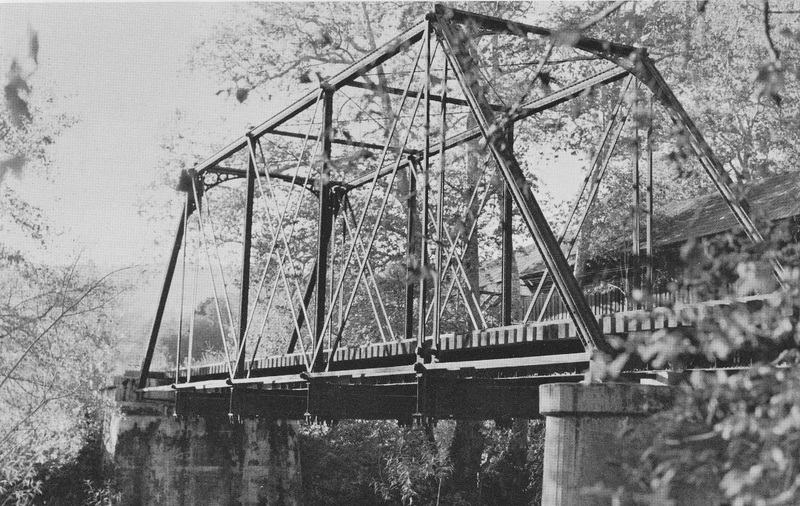 In late 1908, before winter, the Pratt truss was replaced with a heavy-duty Warren thru truss. This was designed specifically to support heavier trains and to keep the river clear so debris could move freely under the bridge. 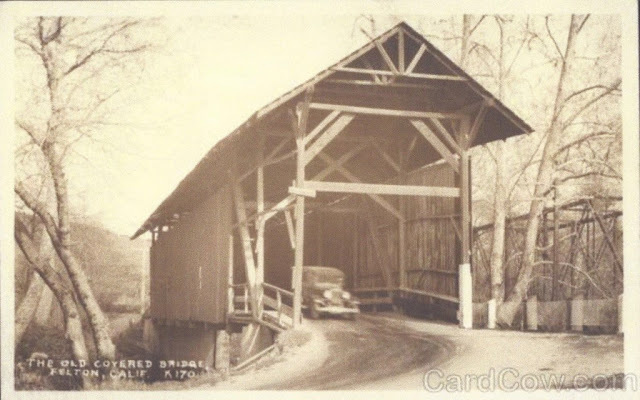 At a latter point in time, a short open-deck plate girder span was extended on the north side to allow vehicular traffic to pass under the bridge along Pipeline Road. This was in place by at least the late 1910s, as the photograph above makes clear. The final railroad bridge in the Felton area is also the newest. 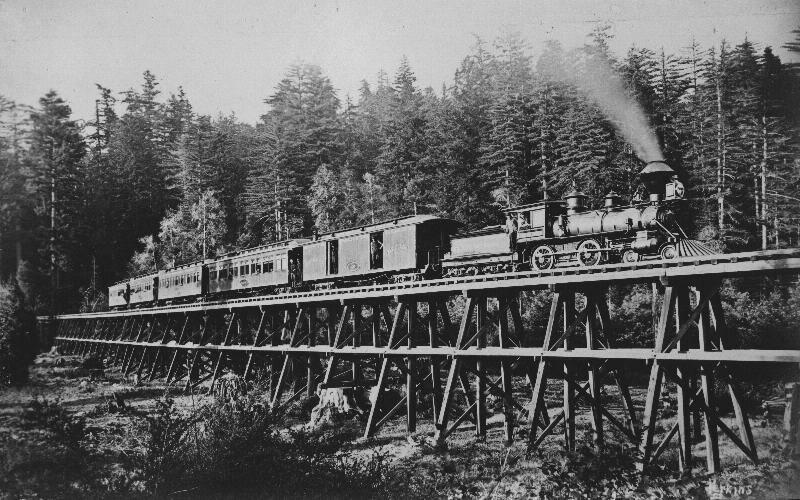 Immediately to the south of the Felton Covered Bridge, a standard-gauge truss bridge was installed in 1908 during Southern Pacific's standard-gauging of its lines in order to abandon the majority of the Old Felton Branch, which was deemed too costly to maintain and standard-gauge for its limited use. At this time, the only regular business along this branch were the Holmes Lime Kilns, which was situated just west of downtown. This new bridge was not built along the Felton Branch but rather was a part of a newly-installed spur that broke off from the Boulder Creek Branch at what would become the entrance to Felton Grove and continued across the river and south, where it forked, with one spur going into the Holmes property and another ending outside Old Felton Depot. The bridge was composed of a compressed Pratt thru truss perched atop a concrete abutment on one side and a concrete pier on the other. A short open steel deck section connected the pier to a second concrete abutment and the railroad grade on the east side. This bridge remained in operation until 1938, surviving even the abandonment of the Boulder Creek Branch in 1934. But the closure of the Holmes kilns during the Great Depression signalled the end for this bridge. It was dismantled and removed by 1940. The concrete pier may have been removed at this time, as well. Only the Big Trees Bridge still exists in its entirety today. The structure is still composed of the 1909 Warren truss bridge accompanied by the shorter plate girder span over Pipeline Road. 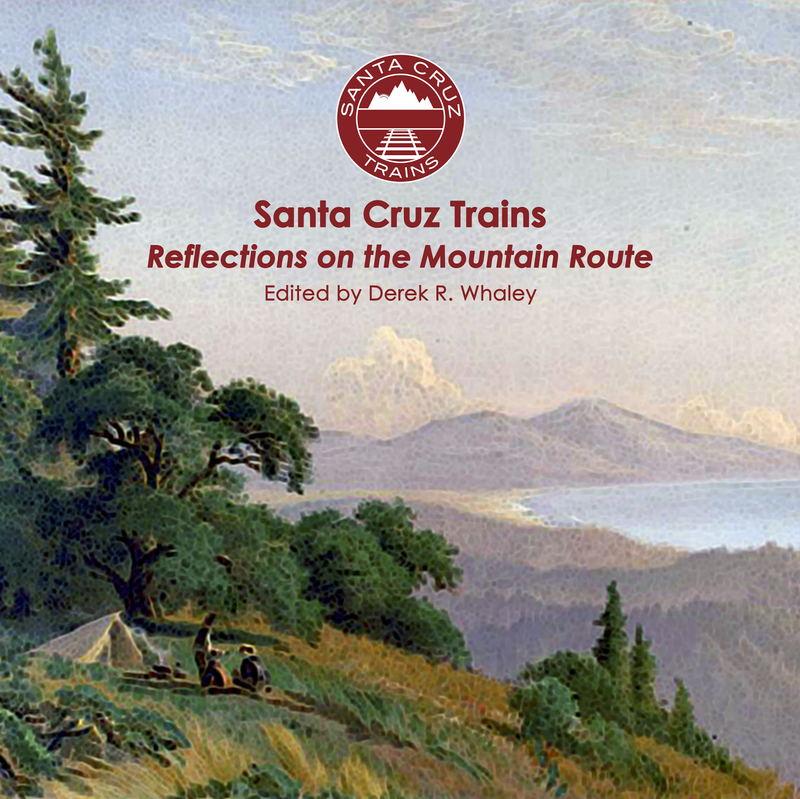 It is crossed regularly by the Santa Cruz Big Trees & Pacific Railroad's Beach Train. Trespassing is not advised as the bridge had no guard-rails and remains a part of a live railroad line. The remnants of the Old Felton Bridge can be viewed from the Felton Covered Bridge on the south side. On the west shore, the concrete abutment is easily accessible on foot, and the fill away from the bridge to the west is also easily noticed, with a driveway to the Felton horse stables cutting through the fill. The eastern abutment is more difficult to see but is intact in the side yard of a home. The ivy-covered abutment has been enclosed with a gate and protects the residence's garbage cans. No remnant of the pier that once sat on the east bank survives—whether it was removed or washed away in a storm is unknown. No remnants survive of the other four known bridges. They all were removed by 1909 and would have been built almost entirely of wood, so they have either been repurposed or washed away. "Hayden Bridge, Lane County, Oregon." BridgeHunter.com, 2018. I have read that originally this trestle was suspended from curb to curb, but as they hauled lime over it, it started to sag, and a concrete pier was installed in the middle as additional support. You can see the pier in one of your photos. Do you think they pulled it out of the river? Or are the remains somewhere downstream in the San Lorenzo?!? Also, there is a line of tiny houses running along Covered Bridge Road, across from the park. I believe all these lots-- from the Laundromat to the bridge, were subdivided out of the old right-of way. Please don't forget the Zayante creek trestle. There is still a curb in the woods on the Roaring Camp side of Zayante creek. I have a photo(in a book somewhere) of an engine going over that trestle. You're right, I didn't even notice that support pier. Good eye! I'll add your segment to the article at a later point (don't have time now). I've never seen any evidence of it in the river but I think it was actually mounted on the shore but in a shallow spot that sometimes was submerged. It's not there anymore, for sure, though. I doubt it was pulled but I've never heard of the remains of a pier downriver either. You are correct. When I do the Felton Grove article I will post a photo of the original right-of-way through the grove. You can also check https://maps.google.com/maps/ms?vps=2&ie=UTF8&hl=en&oe=UTF8&msa=0&msid=200612564695326767482.000464d86cc5713f2a423 for a view of the right-of-way overlaying Felton Grove. I won't forget the Zayante Creek Trestle, I just need to find my photos of it! I have seen two, but I can't remember where I saw either of them! It's quite frustrating. I There is still a pier and the west curb being used for a water main while the wooden east curb is partially buried in the woods across from the Mount Hermon supply depot. I think the photo you have is the same one I saw of the train on the trestle. The other photo is taken from the Graham Hill Bridge looking at the trestle beside it with (two?) women posing on the bridge. I also have seen a photo of the Felton Grove Trestle a few weeks ago with its tracks removed and some people walking across it.